I make my infusions at night before I go to bed and they are ready in the morning. I put my herb in my jar and my water in the pot, and the pot on the fire, then brush my teeth (or sweep the floor) until the kettle whistles. I pour the boiling water up to the rim of the jar, screw on a tight lid, turn off the stove and the light, and go to bed. In the morning, I strain the plant material out, squeezing it well, and drink the liquid. I prefer it iced, unless the morning is frosty. I drink the quart of infusion within 36 hours or until it spoils. Then I use it to water my house plants, or pour it over my hair after washing as a final rinse which can be left on. Using Herbs Simply and Safely Learn how to understand how safe--or dangerous--any herb might be. 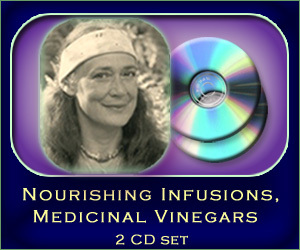 Nourish Yourself with Infusions Discover more about Nettles, Oatstraw, Red Clover, and Comfrey. 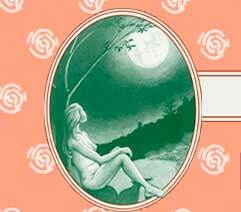 Boost Your Energy Naturally Wise Woman ways to beat fatigue and restore vitality to your life. Building Better Bones Forget Osteoporosis, get flexible and nourish your bones naturally! Having trouble finding herbs for infusion in bulk ?